What are the key dates for abstract submissions? To submit an abstract and have it approved, the presenting author needs to register in full to attend the symposium. What are the abstract submission requirements for invited speakers and poster presentations? The theme of the 2018 AMNDS is “Connect. Collaborate. Inspire.” FightMND is actively trying to invigorate and grow the ALS research community in Australia in an attempt to inspire innovation and foster both local and international collaboration between our researchers, clinicians, and scientists. Submission of your abstract acknowledges consent to publication of the abstract in the Symposium proceedings, Symposium app, and the Symposium website. Abstracts will be submitted under the “oral preferred” or “poster preferred” categories and while every effort will be made to accommodate these preferences the organising committee cannot make any guarantees. Authors accepting the offer of a poster presentation must ensure that their poster is on display at the symposium venue at the designated time. The corresponding author will be notified of the time slot and it must be abided by. Abstracts may be submitted even if previously presented at a national/international meeting. Multiple abstract submissions per person are allowed, but registrants can only give a maximum of two (2) oral presentations during the entire Symposium. There is no limit on the number of poster presentations per registrant. Abstracts should be submitted by the corresponding author of the abstract. The corresponding author is the ONLY person that will receive email correspondence from us. The email address of the corresponding author will be published with any accepted abstracts. The presenting author (for either an oral or poster presentation) will be required to register for the Symposium before submitting his/her abstract in order to ensure their abstract(s) is included in the final program. A link to the Abstract Submission Portal will be included in the email confirmation sent to the registrant following successful completion of the registration process. Formal acceptance of an abstract is conditional upon payment of the registration fee, and abstracts will not be considered for inclusion unless the presenting author has registered to attend the Symposium. Please ensure you have the correct permissions to submit your abstract (eg from collaborators or funders). All abstracts should be formatted according to the instructions below and submitted via the online submission portal. Abstracts must be in English, and be no longer than 500 words and limited to one page only. For multiple affiliations use numbered superscripts. Please note: Accuracy is the responsibility of the author, please ensure you have proof read your document carefully. Whilst every effort will be made to ensure the reproduction of symbols, accuracy of symbols cannot be guaranteed in the reproduction. Abstract Title: Please write the title in sentence case (capitalising only the first word and proper nouns), do not use quotation marks. The title should be as brief as possible but long enough to indicate clearly the nature of the study. The title is not included in 500 word limit. Abstracts that merely state the results that will be presented will be subject to rejection. Do not include author names in the title or body of your abstract because a ‘blind’ reviewing process will be used. You will be asked to enter the names online during the submission process. All abstracts are subject to review by the Program Committee and acceptance into the program is not guaranteed. For oral or poster presentations where scientific / experimental results data is to be presented, the Committee suggests that where applicable the abstract follow the format outlined below. Confirm or refute the hypothesis, supported by statistics if appropriate (p values). References in the text should be cited as numbers in brackets. References should also be listed in order of citation at the end of the text. All authors should be quoted for papers with up to three authors; for papers with more than three authors the first three should be quoted followed by ‘et al’. Incomplete references will be removed at the editor’s discretion. For oral or poster presentations where more general topics (e.g. The role of non-invasive ventilation in MND) are to be presented, the Committee suggests that where applicable the abstract follow the format outlined below. Please ensure that the text of your abstract is spellchecked before it is submitted. Conflict of Interest Statement: If the research described in the abstract was supported by a commercial company you must indicate the company’s role in analysing the data or preparing the abstract. You will be asked to declare any conflicts during the abstract submission process. How do I submit my abstract online? 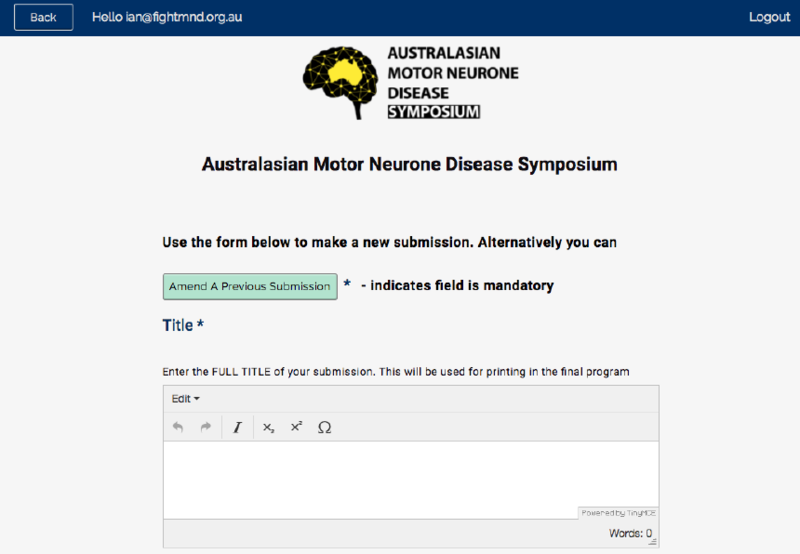 To submit your abstract(s) for the 2018 Australasian Motor Neurone Disease Symposium, you will need to register to use the system and begin your submission well in advance of the submission deadline to ensure that any difficulties can be resolved in good time. To submit an abstract and have it considered, the presenting author needs to register in full to attend the symposium. Complete the submission form using the onscreen instructions for each question. Please use the paste buttons available in the text boxes to paste text (otherwise formatting is lost). All questions with * must be answered for your submission to be complete (we cannot accept your abstract until these questions have been answered), you can still press the submit button and come back at a later time before the submission deadline to answer any remaining mandatory questions. Please check that your abstract is no more than 500 words. If you need to pause your submission and come back to it later, it will be kept on the system. To access it, log back onto Oxford Abstracts and click on the submission. Once you have completed your submission, click the ‘submit’ button. 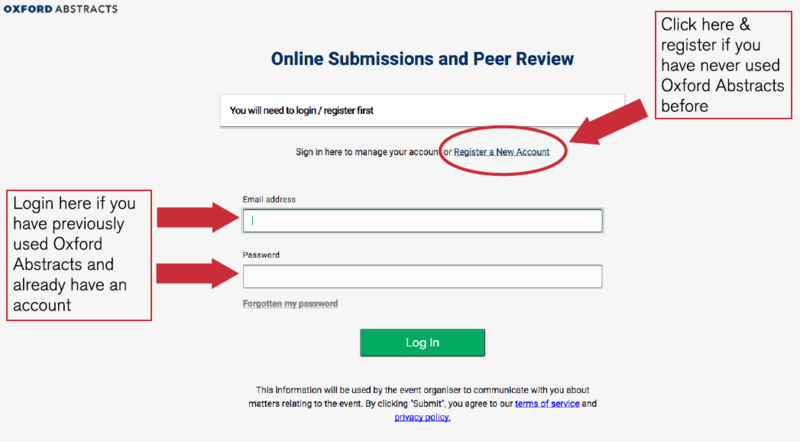 You will receive an email stating your submission ID, please make a note of this as it will be the unique identifier for your submission. If you wish to submit more than one abstract, you can do so by logging back into Oxford Abstracts and clicking ‘New submission’. If you wish to change your answers to the submission questions, you can amend your abstract up until the amendment and submission deadline 18th December 2017. Once amended, you will receive an email confirming that your abstract has been amended. Is there a prize for best poster(s)? Yes, there are 2 poster prizes on offer. Prizes will be awarded for the best poster in both the biomedical and clinical streams. Clinical stream: as per Biomedical stream above but also including medical and allied health professionals working with MND/ALS patients. The presenting author will be required to register for the Symposium before submitting his/her abstract for consideration of a post prize award. To be eligible to receive one of the poster prizes, the presenting author must select the box and confirm their eligibility (as per above) within the abstract submission portal process, to indicate that they wish to be considered for the prize. Indicating that you are eligible for a poster prize will not affect your likelihood of being chosen for an oral communication if you have selected the “oral preferred” option in the abstract submission process. Organisation and clarity: Is the poster content organised in a logical manner, such that experimental problem, approach and results are easily understood? Layout & visual impact: Is the poster layout/look/feel well done? Is there use of appropriate font sizes, readable graphics, suitable colors, pictures etc…? Motivation/Background: Does the poster and the presenting author present sufficient context for the reader to understand the purpose and originality of the experiment as well as the background and motivation for performing the experiment or presneting the case study? Method: Does the poster present sufficient data on the experimental methods used for the reader to understand and judge the quality of the approach? Results & Discussion: Does the poster demonstrate an understanding of the significance of results presented? Presenter should provide appropriate statistics as appropriate. Conclusions & scientific contribution: Does the poster and the presening author present sufficient information and data to support the conclusion(s) of the poster? Does the results of the experiment or case study presented represent an important advance towards MND research or patient care and the understanding of the cause(s), disease mechanisms, potential treatments, and advances to improve care of MND patients? The presenter must be available at an allocated time to answer questions from the judges at the conference. What is the format of the presentation types? Oral presentations are 15 minutes in total length. Presenters will then join a panel discussion at the end of each session to answer audience questions. Posters should be paper size A0, ( 841 x 1189mm). Please ensure that the longest side of your poster is its height, sometimes known as ‘portrait’ orientation. In other words 841mm wide (horizontally) and 1189mm metre high (vertically). Posters the wrong orientation, or exceeding these dimensions will be removed as they will obscure other posters. When is the abstract submission deadline? The closing date for abstract submission is January 10th 2018. Abstract submitting authors will be required to register for the Symposium and pay registration fees at the time of abstract submission. Do you accept encore abstracts? Yes, you can still submit an abstract if the material has been presented elsewhere however you must disclose this information during the submission process. A preference will be given to abstracts for material that has not been presented before. Do you accept late breaking abstracts? No, there is no late breaking abstract submission. The abstracts will be subject to a blind review process after the submission date closes and then review by the organising committee. We anticipate notifying authors of acceptance / rejection in early/mid February 2018. My abstract has been accepted but I can not attend, what do I do? The presentation can be delivered by another named author, this author must have been included on the original abstract submission. Please email [email protected] to advise of any change of presenter. I want to withdraw my abstract. If you wish to withdraw an abstract please contact the organising committee by email as soon as possible Please email [email protected] . I submitted an abstract but the data has changed or is not available, what do I do? Please email [email protected] to advise if you will need to withdraw or update your abstract. When will the abstracts be published? Abstracts will be made available electronically, via the Symposium website, and the app, shortly before the Symposium. A book of abstracts will also be available at the symposium for all paid registrants. To successfully submit an abstract and have it considered, the presenting author needs to register in full to attend the symposium.